Kisii Stone also known as Soapstone comes from the Kisii highlands in the western part of Kenya near Lake Victoria. The main sources of the stone are found in Tabaka where large pieces are quarried out of the hills and then cut into smaller blocks for carving. First the shape is roughed out and then a knife is used to achieve the finished design which is then wet sanded and polished. The entire process is done with hand tools and no machinery is ever used. The soapstone is first immersed into water so that it is easier to mold and carve. Once the stone is dry it will stay in its solid form. Color is used to give a brighter look and is added on to some of the carvings. The cool soft touch of Kisii is unparalleled to any other stone in the world. Named after the Kisii tribe of Tabaka Hills in Western Kenya who use the stone for domestic use and more recently for hand made carvings for export due to their excellent craftsmanship. The carvers used to make mostly wild animal figurines, but more recently have started creating contemporary abstracts, candle holders, bookends, and a variety of other shapes and forms for sale throughout the world. 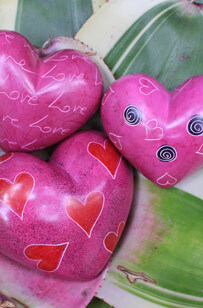 Our Kisii Stone Hearts are available in a range of colours, sizes and unique patterns. They are a great gift idea for your loved ones and are especially sweet to exchange with your partner on Valentines Day. 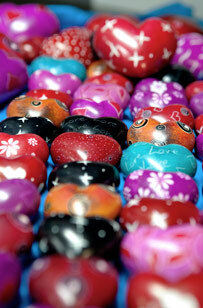 Visit Colour Me Crazy to see our full colour and style range of Kisii Stones. Read more about our Supporting Communities projects.